Whether people realize it or not, there is a battle currently taking place on planet earth and it’s been in play for a very long time. The battle is over the control of information. The people in the world that have access to accurate information have a distinct advantage over those individuals not privy to the essential facts. The most powerful corporations in the world have always had a firm grip on controlling and accessing the regular flow of important information. The world’s media companies are all carefully controlled and monitored by government agencies. In addition, media ownership, at the highest levels, is maintained by a select few. Information that is released to the public is always sanitized first. It’s a well known fact that many wars have been fought by different countries over the control of information. It’s also a well known fact that the world’s governments regularly influence their citizens through the dissemination of information, misinformation and disinformation. Information is so vitally important to our own government that special agencies were created long ago to keep track of every piece of data ever collected. In many situations information is so secret; it’s prohibited from ever being disclosed to the public under national security laws. There are more people than ever before looking for answers to important questions that could make a huge difference in their lives. Information that could help humanity achieve better health, true spiritual ascension, financial freedom, a truer understanding about our existence on the planet, and a much better understanding about what’s really happening in other venues off world is currently available. But it’s only available to a select few. Everyone else is being fed an attenuated version of reality. Our limited understanding of reality is far removed from what is truly taking place in the world and throughout the universe. The purpose of NoFakeNews has always been to encourage readers, that have a desire to do so, to explore a different perspective of reality that they might not have previously thought about. Some people choose to stick their heads in the sand and feel comfortable doing so. Others are now choosing to come up for air for the first time in their lives. I personally think it’s a wise move because what you don’t know can definitely come back to hurt you. The recent presidential election campaigns of Donald Trump and Hillary Clinton have caused irreparable harm to the United States mainstream media. For all intents and purposes the constant attacks by the media on Trump and the soft stance and favoritism they displayed towards Clinton has forever blown the lid off the pot that had previously concealed the truth that the major media players are and always have been the direct instruments of the global elitists and their banking cartels. The global elitists that manage this planet’s business have suffered permanent damage to one of their most important tools that they regularly use to control and influence the perceptions of American citizens. For the first time ever, a large segment of the United States population has lost its faith in the credibility of all mainstream media companies. Americans now believe that mainstream media corporations are the purveyors of fake news. And in response to this most dangerous threat the Illuminati faces, they have decided to fire back at the plethora of alternative media sites that have brought them to their collective knees. The Illuminati masters have decided to engage in a very predictable strategy; one that labels the alternative media as the purveyors of fake news. From this point forward there will be a constant barrage of attacks on any alternative media websites by the globalists. They have absolutely no choice but to try and discredit anything and anyone that they cannot control. The globalists could not control Trump so they tried to discredit and destroy him. They failed miserably and exposed the mainstream media giants they own and operate in the process. It’s funny and damn ironic to see the real purveyors of fake news label the alternative media as purveyors of fake news. This truly is a case of “Alice in Wonderland” where everything is literally and figuratively 180 degrees in opposition to reality. On November 8, 2016 you will have a once-in-a-lifetime opportunity to send a strong message to Hillary Clinton and her Illuminati masters. You can ultimately do what the FBI and DOJ have refused to do. You can finally hold Hillary Clinton accountable for all her past actions. As an American voter you will have the power that is required to finally retire Hillary Clinton from her life in politics. As an American voter you will have an opportunity to elect a real president, Donald Trump that will try to make America great again. If you’re tired of a country that is continuously bogged down with corrupt leaders and corrupt government agencies, vote for a man that can help “drain the swamp” in Washington, DC. It really is up to you. You can right a wrong that has been going on for far too long. Don’t let Hillary Clinton destroy America. Don’t teach your children that it’s okay to lie, cheat, and steal. If you cast your one and only vote for Hillary Clinton on election day, you will instantly become an accomplice in the theft and destruction of your country. You may have to tell your children that you voted for a woman that made millions of dollars by selling state secrets to foreign countries and put our military troops in jeopardy. And she’ll most likely do it again. Why wouldn’t she? If American voters won’t hold her accountable, who will? The FBI? The DOJ? Your vote is important this Tuesday because it gives you as much power as anyone else voting in America. Regardless of how much money you earn, how rich or poor you are, you will have a chance on this one day to vote and make an important decision for your country. Make your vote count on election day for something that is good in the world. Don’t vote for a candidate that will maintain the same kind of corruption and dishonesty that has been taking place for years at the highest levels of the US government. Thank you for taking the time to read this letter and for taking the time to vote this election day. Many people in the US are tired of the same old thing when it comes to Democratic and Republican presidential candidates that work behind the scenes for the Establishment. In past elections the powers that be were always assured a victory because they ultimately controlled both presidential contestants. A little different situation exists this time around however, as Donald Trump appears to be for all intents and purposes a candidate that has no strings attached to his sleeves. For the first time in a longtime the US election appears to have only one candidate (Hillary Clinton) controlled by the Establishment. With the election fast approaching, Michael Moore took the time to explain why he believes Donald Trump will win the US Presidency on November 8. We believe he is spot on! Las Vegas, Nevada – Last night Americans watched with great interest the final presidential debate between Hillary Rodham Clinton and Donald J. Trump. The contest turned out to be the venue that everybody had hoped for. Both Republican and Democratic party members claimed their candidate was victorious after the 90 minute event. Trying to be as objective as possible, I believe Donald Trump got the performance he really needed and won the contest. Hillary Clinton appeared frazzled at times and seemed to be under constant distress when trying to defend accusations stemming from the Wiki Leaks materials. Clinton also appeared confused several times, and offered vague answers as she tried to pivot away from more than a few questions coming from the debate’s moderator concerning her involvement with what many Americans believe are extremely important subjects. Donald Trump on the other hand remained calm throughout the entire debate and scored points repeatedly when he pressed Clinton on her mishandling of six billion dollars, her involvement with paying protesters to disrupt Trump’s rallies, and her willingness to take millions of dollars from countries that routinely mistreat and kill defenseless women. At one point Trump challenged Clinton to return monies she received from such countries. Clinton just stood there looking dumbfounded. Trump definitely delivered his best performance out of the three debates on this particular evening. On the major issues facing America Trump was strong, Hillary not so much. Trump spoke intelligently about his detailed plans regarding economic recovery for the country. He showed great vision and his blueprint for success seemed logical and realistic while Clinton’s economic proposal for America seemed to lack vision and appeared to be nothing more than a rehash of President Obama’s ideas that haven’t been successful in over eight years. On the whole, I believe Trump delivered a major victory for Republicans and performed with presidential-like style the entire evening. The USC Dornsife/Los Angeles Times “Daybreak” poll tracks about 3,000 eligible voters until election day, asking on a regular basis about their support for Hillary Clinton, Donald Trump or other candidates as well as their likelihood of actually casting a ballot. The above referenced poll was considered the most accurate poll in the prediction of the 2012 US presidential race. How Can Americans Elect Hillary Clinton? According to the US Mainstream Media (MSM), Hillary Clinton is leading Donald Trump in the most recent presidential polls. How can this be? How is it possible that American voters are poised to cast their votes for a woman (Clinton) that has compromised the security of the United States by mishandling classified government documents? How is it possible that American voters are so hell-bent on electing a candidate that has been proven through leaked emails (Wiki Leaks) to be the most corrupt presidential candidate in the history of US politics? Hillary Clinton will undoubtedly attempt to destroy America just as she had a major hand in the destruction of Yugoslavia, Libya, Iraq, and soon, Syria. This is a woman that represents the interests of the global elitists that want to disarm American citizens. They also want to replace the current Supreme Court Justices with new ones that will absolutely support their agenda of destroying the entire country. Oh, and by the way, they want to start WWIII. With Hillary in the White House, the Establishment will certainly accomplish their goals. Hillary Clinton sold out our country in her prior position as Secretary of State to foreign countries that have had longstanding histories of being hostile to America. Why wouldn’t she continue to sell out America after being elected as our commander-in-chief? What Hillary Clinton has done with the handling of classified documents on her personal computer server was far worse than what Richard Nixon ever did with respect to Watergate. How can the polls that currently show Hillary Clinton in the lead over Donald Trump be accurate? These polls have to be wrong or they must represent an over sampling of pro Hillary supporters. Do we really trust the MSM companies to deliver the viewing public fair and accurate polls? The important thing for voters to consider in the upcoming election is the complete lack of integrity that surrounds the Democratic nominee, Hillary Clinton. She should have been indicted by the Department of Justice and disqualified from even running for president. 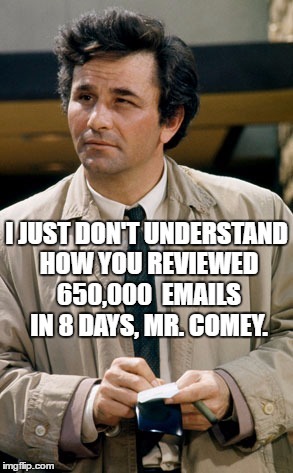 In the minds of most Americans, the FBI and the US Department of Justice absolutely dropped the ball concerning Hillary’s email investigation. In a few weeks voters will have a chance to right that wrong and finally put an end to Hillary’s political career. Now go out and vote because this one is for all the marbles! Like many Americans, I watched the second presidential debate on Sunday, October 9 not knowing what to expect. On this particular evening Mr. Trump walked into the debate forum with his political backside up against the ropes. The 48 hours leading up to the second debate was tantamount to watching Apollo Creed (Hillary Clinton and her establishment controllers) attempting to punch the lights out of Rocky Balboa (Mr. Trump) in a Hollywood boxing ring. Just 48 hours prior, a hot microphone recording of “The Donald” talking about his sexual conquests more than a decade ago had made its way into the MSM headlines. Undoubtedly, the procurement and public release of this ancient recording, in the minds of the powers that be, was going to be the fatal blow to Trump’s current presidential campaign. Hillary Clinton along with her husband and former President, William Jefferson Clinton must have been tasting victory, even believing there was a good possibility the Republican nominee would soon yield to pressure from within his own party and throw in the towel. And then something incredibly rare happened on that debate stage in St. Louis, Missouri. Donald Trump (Rocky Balboa) got himself off the ropes like no Republican before him and knocked Apollo Creed (The Clintons) out of the boxing ring. Donald Trump, for all intents and purposes revitalized his campaign as well as his chances to claim the US Presidency. Donald Trump was brilliant from the start of the contest brushing away various jabs coming from Clinton and the debate moderators who peppered him with questions about his recorded remarks about women. Honestly, he did a pretty decent job of appearing sincere when apologizing to his family and the American viewing audience. He also did an equally nice job of explaining that the recording in question was the product of two guys engaged in “locker room talk” and that the recording was not a representation of the person he is today. Mr. Trump was very convincing and according to many online polls, the American public seems to have bought his apology. Next, Donald Trump went on to paint Hillary Clinton as a career criminal and quickly had her on the defense the remainder of the evening. Trump pounced on Clinton’s deletion of 33,000 emails and how she made a habit of attacking the plethora of women that were the sexual assault victims of her husband. Hillary appeared to be in distress the entire night and she looked like a beaten and tired woman before everything had ended. On this evening she quickly changed places with Trump in the boxing ring and found herself up against the ropes often. If this had been a real boxing match it would have been stopped in the earlier rounds by a medical physician in order to prevent a serious brain injury. I don’t care what the MSM writes or reports about the results of this debate. I don’t care what the MSM tells us about how well Hillary performed in the contest. I don’t care if the MSM reports that Donald Trump is trailing in the polls by 20 points. Don’t believe any of it. I really think that this was a much bigger night for Trump than the MSM will ever disclose. And I think a lot of people will be very surprised when the final and only poll that counts is conducted on Election Day.